The following two charts summarize existing single-family home sales by a Realtor® for Lee, & Collier Counties over the past two years. 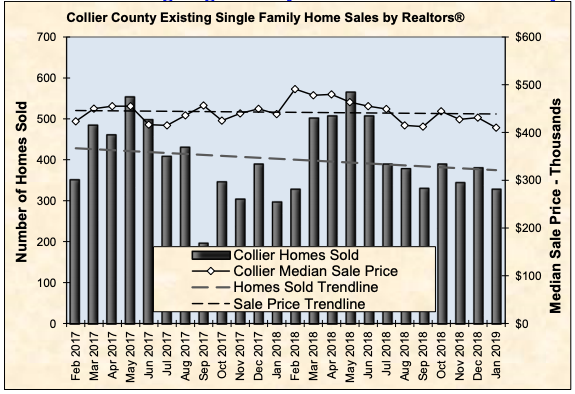 Collier County Single-family home sales were 327 units in January 2019, up 10 percent from January 2018. The median price in Collier County declined by $28,500 to $410,000 during this period (Chart left). 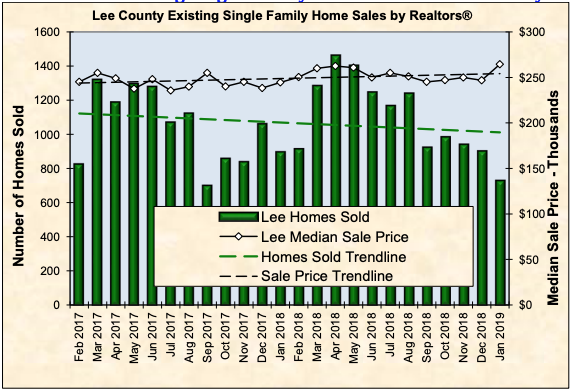 Lee County Single-family home sales fell to 728 in January 2019, down 19 percent from January 2018, while the median price increased from $244,500 to $264,498 (Chart right). Source: Realtor® Association of Greater Fort Myers and the Beach, Inc.
For the full PDF report click here. Report provided by FGCU Regional Economic Research Institute - March 2019.